New Fixed Fares. Lowest In Town! It’s our lowest fares yet! Who doesn’t love a great deal? But finding one may take a little work. Luckily, when it comes to finding the lowest car fares in the Klang Valley, it can’t get any easier. Now you can go to your favourite restaurants in Bangsar, or drop by KLCC for a spot of shopping for less than before! Book your ride and let’s roll. 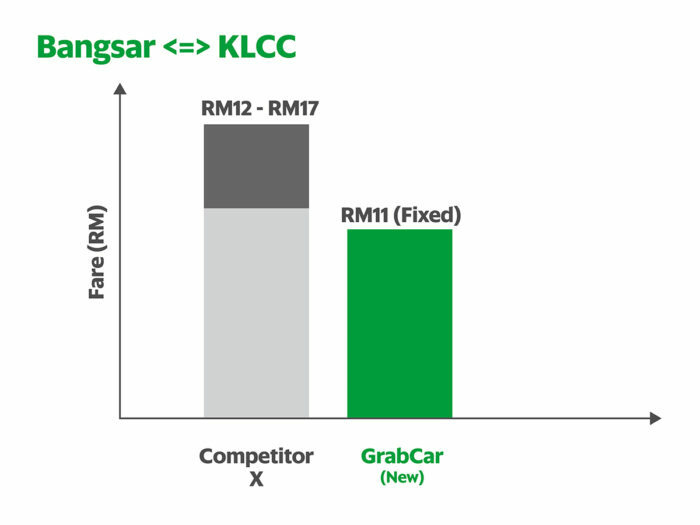 Applicable for all GrabCar (Economy) rides in within Klang Valley only. Toll charges are not included in all fixed fares shown in the app and will be charged separately to the passenger. Applicable from 10th Oct 2016 (12am) onwards until further notice. Valid for unlimited number of rides. New fares are not applicable for rides to/from KLIA, KLIA2 & Genting Highland.